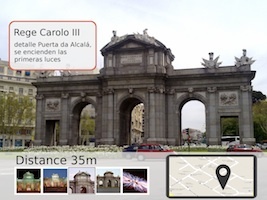 Augmented Reality (AR) is a view of the realworld environment which contains overlaid computer-generated media elements like images, videos or 3D models. Your gateway to the world of Augmented Reality on mobile devices is a so called "AR-Browser". The most prominent AR-Browsers are junaio, Layar, Wikitude and Aurasma, which are free mobile apps with a huge number of users. Our service enables your creative advertising campaign and mobile apps to benefit from this experience and to get in touch with this target audience. AR is the best way to enrich existing print media with entertaining and interactive content. A Location-Based Service (LBS) reveals nearby places by making use of GPS data collected by a mobile device. Use this geolocation in innovative manners to boost your business-range and brand-awareness. With this additional information, it's never been easier to lead your customers directly to your point of sales or event locations. AugmentedGallery is a location management tool that allows you to add extra-information to realworld places without programming skills whether at home or on the go. With our cloud-based service, your content is instantly shared on all major AR platforms, ready for the world to see! 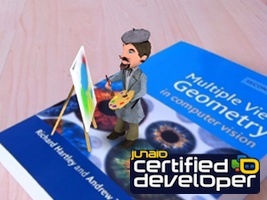 AugmentedGallery belongs to the official Junaio Channel Creation Tools and allows non-experts to contribute to the world of augmented reality. Add high-quality user experience (UX) and latest technologies to your mobile app project! With many years of experience developing mobile apps and Augmented Reality technologies, our expertise was certified by metaio, the world leader of Augmented Reality solutions.